The descendent of a black American slave has sued Harvard University, claiming the college profits off images of her alleged ancestor. 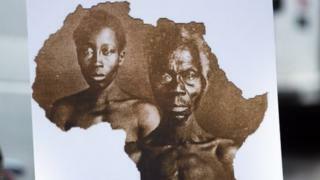 The pictures, commissioned in 1850 by a professor seeking to prove that blacks were an inferior species, is believed to among the first photos of US slaves. Tamara Lanier’s lawsuit says the school is “perpetuating the systematic subversion of black property rights”. It comes as several US universities grapple with their racist histories. Harvard spokesman Jonathan Swain told the Associated Press the university “has not yet been served, and with that is in no position to comment on this complaint”. The images, which were daguerreotypes, an early type of photograph, were made in a studio in South Carolina, and show a man known as Renty, stripped naked to the waist, along with his daughter Delia. The pictures were commissioned by Harvard biologist Louis Agassiz, who used them to argue for slavery in the US. Ms Lanier, a retired probation officer who claims to be the great-great-great-granddaughter of Renty, asks in her lawsuit for Harvard to return the images to her family, pay unspecified damages to her and acknowledge that it was “complicit in perpetuating and justifying the institution of slavery”. It remains unclear whether Ms Lanier can prove her genetic lineage to the man she calls “Papa Renty” and grew up hearing bed time stories about. “What I hope we’re able to accomplish is to show the world who Renty is,” she said at a news conference in New York City on Wednesday. The images were discovered in 1976 in a storage attic at Harvard’s Peabody Museum of Archaeology and Ethnology. According to unearthed records, Renty was born in Congo. Ms Lanier says she attended a 2017 conference at Harvard on the links between academia and slavery in which an image of Renty was projected over the speakers. Ta-Nehisi Coates, who wrote a popular essay about paying reparations to black Americans for slavery and discrimination, attended the conference and told the New York Times that he understands why Ms Lanier was offended. “That photograph is like a hostage photograph,” he said. The suit also alleges Harvard requests a large licensing fee to use the image and points to a book the university sells, From Site to Sight: Anthropology, Photography, and the Power of Imagery, for $40 (£31). Harvard is one among several elite US universities criticised for failing to recognise their racist legacies. In 2016 a member of Yale University’s kitchen staff was arrested after he smashed a stained glass window depicting slaves toiling in a field, telling police that “no employee should be subject to coming to work and seeing slave portraits on a daily basis”. The charges against Corey Menafee, who is black, were later dropped. In 2017, Georgetown University in Washington DC apologised for selling 272 slaves in the early 1800s and offered an admissions advantage to the descendents of the men, women and children who were sold in order to cancel the university’s debt. Harvard Law School removed its official seal in 2016 after it was found to have been used as the family crest of a notoriously brutal slave owner, Isaac Royall, who was known to have ordered 77 enslaved people to be burned alive.